Promise this will be my last beetroot recipe for the month. Ha ha, of course it will - it is the end of the month. Anyway, please please just humour me with the name of this recipe. After all, 'tis the Halloween season of spooks, chills and thrills. Our evening TV is heavily being overtaken by horror and slasher movies and gore. 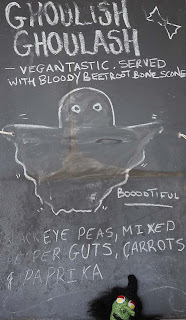 So I thought, I would incorporate a little of it into my vegetarian home cooking. Truth is since starting blogging, I haven't really made many Halloween themed vegetarian treats, other than the obvious Red GHOULash. Simply because its not something, I participate in. However since moving back to Wales, closer to family and moreso closer to nephews and nieces who pro-actively want to be part of anything that their peers are involved in. Well, I don't know how long I will be this close to them , so this week I have namely for them decided to play cool Aunty and have created a number of Halloween themed vegetarian savoury nibbles and bites. You have already seen my Vampire Eggs aka Beetroot Scotch Eggs; and my vegan Zombie Pies filled with roasted autumn vegetables. 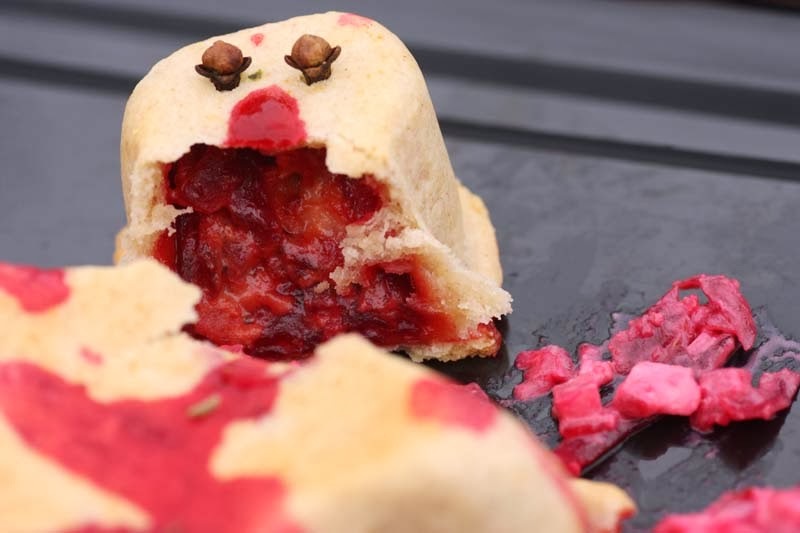 After creating the vegan Zombie aka Voodoo Doll pies , I wanted to create another vegetarian pie, however this one had to have some red gory filling inside of it ...So when you cut it open, you see vegetables that what would mimic blood and guts. 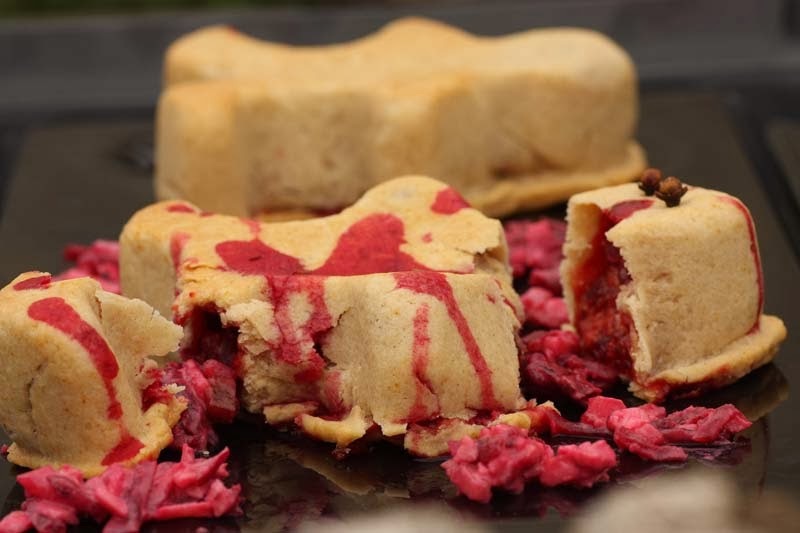 So here they, may I present to you my 'Bloody Massacre Beetroot Man Pies'. What do you think?! You will need 6 silicon gingerbread people mould. You can also make one large pie or 6 individual ones in a muffin tin. In a large bowl, stir all the Beetroot Cheese filling together, season to taste and set aside. Preheat the oven to gas mark 4/180oc. 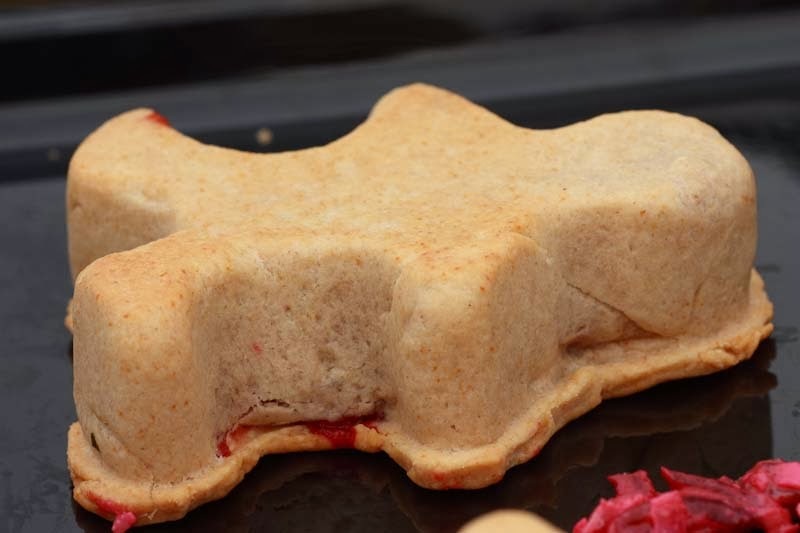 Roll out the pastry to fit your moulds. Fill the pastry with the roasted vegetable filling and beans and press down well. Then roll out the remaining pastry for the lid. Using a sharp knife, cut off excess pastry and repeat process for other pies. Bake for 35 - 40 minutes depending on the size of your shortcrust or hot water crust pastry pie(s). Allow to cool, before serving. 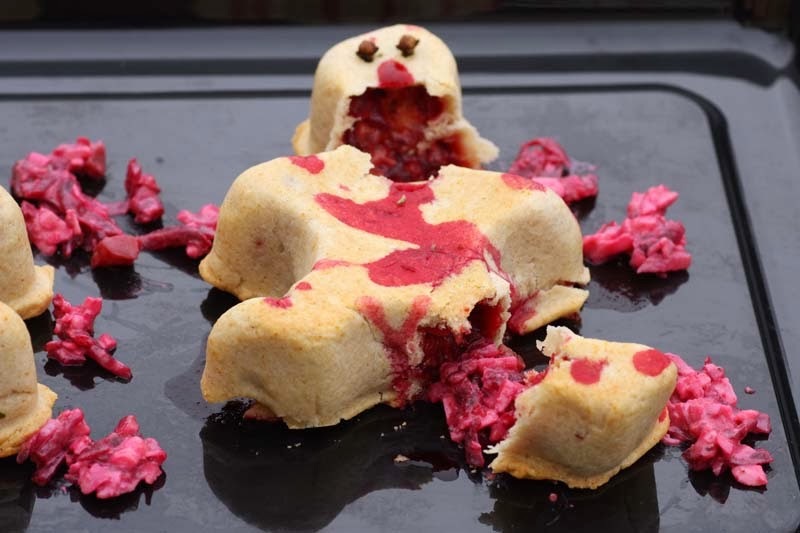 Massacre Bloody Pie Beetroot Man Pie. Thank you Adi. Hope you had a good Halloween too. I bet they were tasty, even if not tasteful! Thank you so much Johanna. I enjoyed partaking this year, may have to do it again next year, more for the kids though - I think my party days are coming to an end :( in fact they never started. Hey ho, I am glad you are making more of it though, must do so for the little one - in your case Sylvia. Take care for now, will be on over later. Thank you Elizabeth. I should have taken a pictures of both the ingredeitns mentioned, I will and maybe try and insert it here if I can, otherwise may use it another recipe - my husband loves my Welsh Pies, and i am hoping to make an up-dated version of them, so another entry with these two Welsh ingredients will be coming your way later in the month. PS Made me smile with the title of cool aunty. That is so cute, clever and looks delicious, all rolled into one! Thank you, yeah I was pretty chuffed with them.